Iberia, as we announced a few months back, has been toying with the idea of a new logo for a while, accidentally letting it slip on the nacelle of one of their airbus fleet, which generated a buzz on the net of the future look and feel. The new logo, which will feature first on an A330, along with new livery, has (no surprises here) been pieced together from a survey of 9,000 people. It’s definitely a case of design by committee, trying to please all and eventually (seemingly) pleasing none. The logotype, which appears bulbous to the eye, perhaps in a nod to the fact the curve of the plane makes text appear to ‘bulge’ toward the viewer, is safe, rounded capitals. Most likely in design 101 speak to showcase ‘authority, solidity, longevity’ due to the capital lettering and ‘a sense of warmth and care’ with the slight rounded edge. Funnily enough check how this video above uses the ‘old logo’ to brand the video talking about the new logo, this lack of attention to detail, doesn’t go unnoticed. In what seems to be a fairly boring and familiar approach, the text and icon graphic, which is somewhat a mix of the American Airlines bird and the Avianca tail, along with the traditional open space fuselage approach of airlines such as sister company BA and their future step-brother American. Ok, so we understand the connection to the spanish flag, the ‘sweeping element’ associated to wind, flight and travel, but we were hoping for more. We stated that our heart sank when we saw the iconic previous design was fading away, and actually, looking at this design now it is fully launched, we actually can’t make an emotional connection to the livery design. It’s simple, safe, and sad to say, fairly boring. Somehow, lovingly and very quickly being dubbed the ‘fast-food wrapping’ airline of the skies on online forums. 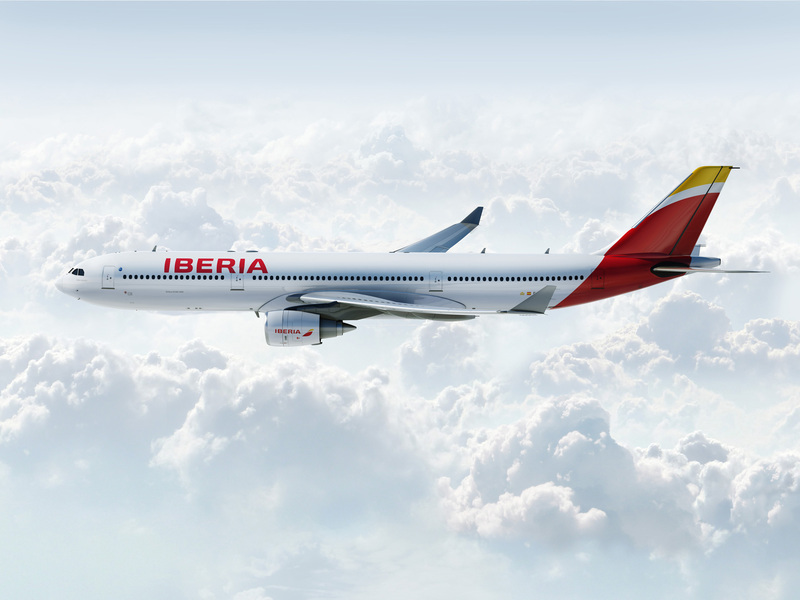 The new livery, which has been dressed up with the usual press release fluff “Iberia’s new image both symbolises and contributes its own momentum to the transformation plan, which aims at reshaping the company into a strong, modern, competitive and trend-setting airline. The launch of the new logo and livery is timed to coincide with the first fruits of these efforts,” …. sorry what?! That doesn’t actually mean anything and isn’t actually backed up with any true core design ethos. Even Iberia’s CEO Luis Gallego noted that “it’s not just a matter of changing the company logo, but of bringing the new image to every corner of Iberia, so the change will be perceived in all our products and the service we provide to our customers.” Again, stating very little reason for the change apart from to lift the image of the airline. A problem that according to trip reports, stems from deep within the customer service ethos of the airline itself. Perhaps this livery change may only be skin deep. Sadly, Iberia, this isn’t a winner for us. A full historical chart of Iberia’s Logos over the years. The livery will be rolled out from November this year, along with areas within the company where the logo is used, there is a gradual replacement program to fully stamp out the older logo. In our bid to keep the old livery flying (at least in our memories), here’s a picture to keep you smiling just a little bit longer. Totally disappointing. In all honesty; I really am lost for words. Frankly it is a neat and clean livery but still lacks some punch to say the least. Frankly speaking new logo and new livery look as bad as the service standard aboard Iberia. Cheap, poor, boring, dull, stuffy and moldy. Total disaster. Francamente nuevo logo y nueva imagen librea tan malo como el nivel de servicio a bordo de Iberia. Barato, pobre, aburrido, mal ventilado y moho. Desastre total. Oh goodie, another Eurowhite scheme . UGH! Boring logo. Super boring font. Totally uninteresting, especially compared to the previous livery. I’ve always been a fan of the “marque” of the Euro carriers, like those on Air France and British Airways. I think the logo itself is fine, stylish even, but looking forward, the rebranding is such a missed opportunity. They could’ve at least place the logo beside the titles rather than on the engine…and that negative space tail design, that doesn’t work. A livery that says absolutely nothing.